The 29th Jazz Jol fundraiser featuring a host of local and national talent is set for tomorrow night (October 27 at the Centre for Jazz and Popular Music at the University of KwaZulu-Natal, Durban. This year’s popular annual music event features a variety of talented musicians including Sweet Concept (a UKZN Alumni Band), UKZN Vocal Group and UKZN’s Big Band along with a selection of students taking to the stage in an evening tailor-made for lovers of jazz and popular music. “The Jazz Jol was not only started, all those years ago, as an event for music-lovers but also in an endeavour to raise funds for the Ronnie Madonsela Scholarship,” explains lecturer Neil Gonsalves. “The Scholarship provides bursaries for deserving UKZN music students from disadvantaged backgrounds, as well as helps to fund students’ travel visas for overseas trips, and national travel and accommodation to the National Youth Jazz Festival in Grahamstown and other educational festivals, workshops and conferences. This issue of mobility, of getting around and sharing ideas and networking is key to a musician’s success in the future. Through mobility the musicians are able to exchange knowledge and gain important experience both nationally and internationally. Sweet Concept was formed in 2006 by Siyanqoba Mthethwa, Thabani Gapara and Siyanda Zulu. Most of the band started off as backup singers for some of South Africa’s more prominent and illustrious artists including Swazi Dlamini, Siphokazi, Judith Sephuma and Ernie Smith to mention a few. The band won further accolades after competing in The Suncoast Jazz competition, winning prizes in categories of Best Band and Best Composition. 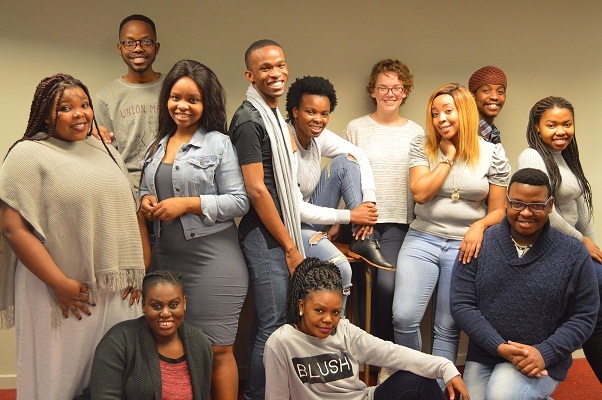 UKZN Voices, directed by well-known Durban musician and Jazz Voice lecturer Debbie Mari, features singers from the Jazz and Popular Voice programmes in the School of Arts at UKZN. Singing mostly close harmony arrangements, the vocal jazz ensemble will perform A Nightingale Sang in Berkley Square, Java Jive, Almost is Never Enough and Charlie Chaplin’s best loved composition Smile. The group comprises Andiswa Maduna, Nomthandazo Madiya, Neli Skhosana, Monique Naude (Soprano), Nomalanga Khanyile, Amanda Biyela, Wandithanda Makandula (Alto), Busisiwe Hlokoza, Siphelele Mthiyane, Sanele Khubisa (Tenor), Thembelani Mkoka and Thabani Dlamini (Bass). Certainly a major drawcard to the Jazz Jol is the appearance of the UKZN Big Band 2017 directed by Burton Naidoo, and featuring students from UKZN. The band this year focuses on House Music – and unusual approach to electronic music that started taking the world by storm in the 1980s. House Music, is characterised by its 'four to the floor', groove and minimalistic harmonic and melodic sequences. The UKZN Big Band House Performance will focus more on African House Music such as Micasa, Davido and Black Coffee and the repertoire features arrangements by UKZN Students Phumlani Mtiti, Riley Giandhari, and Sinalo Zulu. This year’s Jazz Jol takes place on October 27 at 19h00 and is funded by Concerts SA, a joint South African/Norwegian live music development project housed within the SAMRO Foundation.